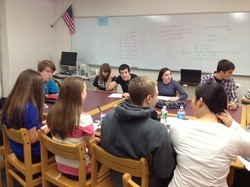 The Science Club met to discuss participation in the Bio Expo. We skyped with Tom Ranieri from Costa Rican Resources to learn more about bio-mimicry. Tom helped us think about how structures and forms in nature can be used to formulate an idea for our project. Some of our initial ideas were to use the Green Basilisk lizard 's ability to run on water which would be then applied to a boat propeller to reduce use of fossil fuels and ocean pollution. Another idea was to use the Basilik crown design in helmets to minimize impact. We also had an idea to use the Golden orb spider web design and apply it to a hammock. Today was the day we all decided on The Silk Screen. Originally we had thought about using the Golden Orb Spider's web structure to create a safety net to be placed under bodies of water before they froze over. If someone were to break through the ice, they would be safe. We had talked this idea over, but were still thinking of other ways we cold use the spider and its silk/web. We took a break and one of our group members was talking about how he dropped his phone that morning. That led to others telling stories about how they have dropped and broken their phones. Then the thought occurred to us, what if we could use spider silk to prevent phone screens from breaking. We then began thinking of different ways to make that happen. Today was also when we placed ourselves in groups: Publications, Experimental, Engineering, Technology, and Communications. Today we all met as a group again. We talked over how we wanted to present our idea and then split off in our separate groups. The publications team came up with an introduction for our project paper. The experimental group thought about different ways to test our product and wrote a procedure. As shown in the picture to the right, students in the engineering group took apart some recycled cell phones to see the components and find the best way to make our product. Students on the technology team started building the group's website, and the communications group started to design our display. Today a few group members stayed after school to see what force would break a phone screen. We dropped a metal pole through a pipe onto the screen and watched it shatter. We tested the wooden pole with total weight of 200 grams and found that it was still not enough to break the iPhone screen. We decided that the screen did not break because the pole was made out of wood. We then decided to switch the pole with a metal one. We tested the metal one and the screen broke with the first attempt at a height of 10cm from the ground. We consulted with a physics teacher, Mr. Dubois, and an integrated science teacher, Mr. Cogliser who helped us to understand more about the physics related to our experiment and help us think about changes to make to our experiment. Today, we decided to continue using the wooden pole because the metal one had too much mass. We also decided that instead of allowing the pole to hit the screen directly, it should hit a coin on the screen so it would have a similar effect to the metal pole. We tested this set-up with the pole weighing 190 grams. There was no damage to the screen. We then began to think that it didn't shatter because the wooden pole had a blunt end, unlike the metal pole that was pointed and the force applied was not distributed evenly across the screen. We ended the day by getting the supplies to sand down the bottom of the wooden pole. The phone used in the following video was a different type than the ones we tested on. This phone was used to determine the experimental design necessary to perform the experiment and how much minimum mass was needed to break the phone so that we would have enough resources to complete our testing.